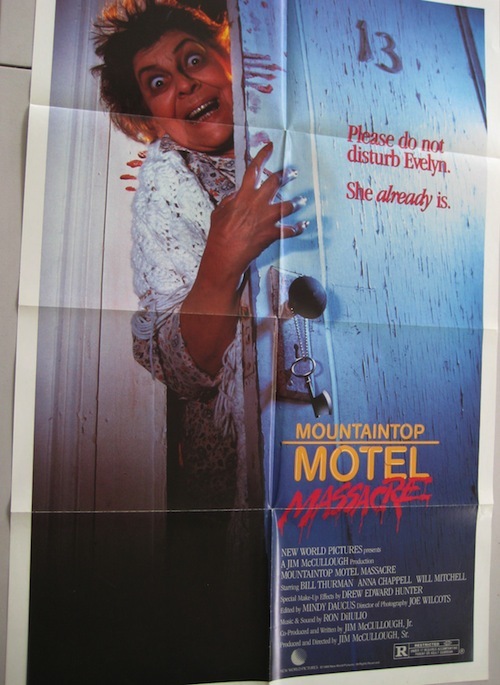 Ebay Find Of The Week: ‘Mountaintop Motel Massacre’ Promotional Poster! Oh yeah! It’s perfect! Granted, your guests might immediately walk away from your new home or possibly curse at you, but I bet you’ll be the only one on the block with a Mountaintop Motel Massacre poster hanging on their wall. Yes, this 1986 terrible but entertaining slasher movie has it’s own unique charm – and also a pretty amazing poster to boot. And if you’ve got about $70 to spare, you can hit up eBay right HERE and grab it while it’s hot. You might want to wait for the price to drop a bit, but I guess you really can’t put a price on something this special anyway, right? That Evelyn is a real looker btw.